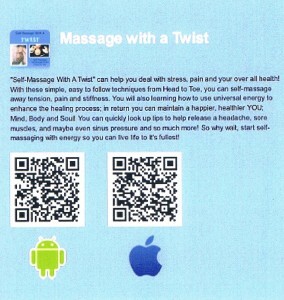 What You Can Expect In This “Self-Massage With A Twist” App for Only $3.99!!!! It is recommended that you read the whole book first before trying any of the techniques. “Self-Massage With A Twist” can help you deal with stress, pain and your over all health! With these simple, easy to follow techniques from Head to Toe, you can self-massage away tension, pain and stiffness. You will also learning how to use universal energy to enhance the healing process; in return you can maintain a happier, healthier YOU; Mind, Body and Soul! You can quickly look up tips to help release a headache, sore muscles, and maybe even sinus pressure and so much more! So why wait, start self-massaging with energy so you can live life to it’s fullest! - Learn the Twist !!! Cynthia has used all of these techniques to help maintain your health as a Holistic Practitioner. Just click on the link and enjoy just a little sample of what is on the app: Head -Self-Massage With A Twist .